I absolutely have only positive things to say about Maxine. She explains and demonstrates each posture, offering alternatives to suit all levels and abilities. I leave class feeling empowered and relaxed, ready to face the stresses of the week ahead. I love my yoga practice with Maxine. She is an excellent teacher, who gives very clear instruction and offers many options for working at different levels, thus encouraging you to make good progress in your own practice, whilst working through postures at a level that suits you. She is very supportive where advice is needed, including how you can make adjustments to help strengthen areas that may be weak due to injury. I've been attending Maxine's classes for over 12 months and couldn't imagine going without my 'double dose' sessions with her. At the end of each class I feel strong, focused and connected, and ready to deal with the week ahead. Facing a diagnosis of a physical health challenge that has the potential to impact significantly on your life, is not something I ever thought I would have to do. I attended Maxine's class by chance as I was advised by many, that yoga would help alleviate some of the physical difficulties I faced. With emphasis on correct posture, working to my personal limits, and a very friendly approach to yoga, Maxine helped me to improve my physical health to where I do not require pain relief as my physical challenges have been minimised to a manageable level. 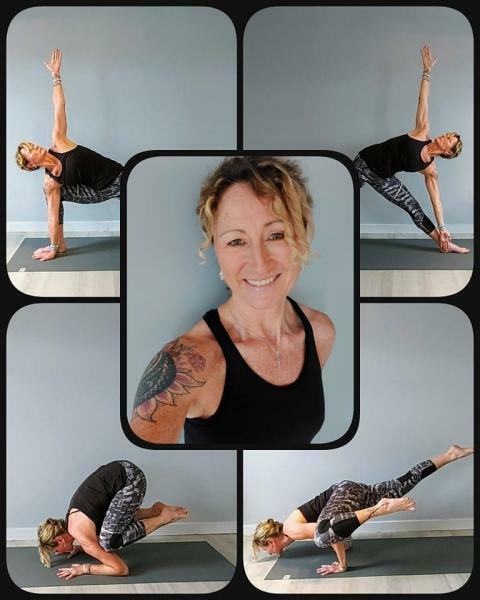 I highly recommended Maxine as Yoga teacher for her teaching, support, knowledge and amazingly likeable nature especially for those new to yoga but also for those who wish to take their yoga to the next level. I attended Maxine's classes for several years prior to moving out of the area and always found her to be professional and stimulating. Her classes were fun but taxing and my yoga practice developed well during this time. I would highly recommend Maxine for both beginner and more experienced students. Max's classes are challenging and fun. She always offers a range of stages for each posture so each person can work to their own level. One to one sessions have been really useful and, as a relative newcomer to Yoga (and not a 'natural'), she has helped me gain confidence in what I can do and also helped me make small adjustments that have made big differences to me practice. Highly recommended! Maxine is an excellent teacher, is very clear and concise. I have experienced both classes with Maxine and personal 1:1 sessions to improve my postures and strength - Maxine has an amazing ability to gently nudge and encourage slight changes to improve posture and style. Depending on the circumstance, Maxine may offer adjustments or be more hands off if it's a group situation - both work equally well. The meditation at the end of the sessions is excellent and I can't recommend Maxine enough for the whole yogic experience. Having been to many of maxine's classes , workshops and retreats , i can say they are always fun , challenging and rewarding . She explains the postures with enough detail for everyone , from beginners to more experienced students , to gain something . Her sparkling personality shines through , along with her obvious enthusiasm for teaching ( and doing ) yoga . Probably why her classes are always busy . She is amazing . Maxine is a fabulous yoga teacher and all round great person. She takes time and effort to explain and demonstrate fully, is aware of all levels in the class and supports accordingly without making anyone feel like a beginner. Her workshops and retreats are a fulfilling and thoroughly enjoyable experience. I can highly recommend Maxine.